45 volunteer members of San Diego Task Force 8 will leave to help with Tropical Storm Harvey. NBC 7's Alex Presha reports. 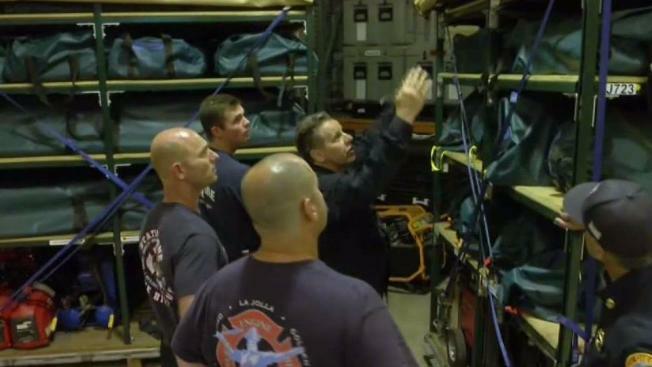 In a non-descript warehouse not too far from the airport San Diego's California Task Force 8 is gearing up. The urban search and rescue team is headed to Texas to help with the Tropical Storm Harvey response effort. Out of the 210 members in the volunteer task force, 45 will ship out to the Gulf Coast, and they have to be ready for everything. “We have multiple areas of focus including search, rescue, building shoring, hazardous material response,” said Battalion Chief David Gerboth. This time the team will be focusing on swift water rescue. Catastrophic flooding is expected with up to 48 inches of water. Harvey is now a tropical storm, but Chief Gerboth said they're treating this like some of the major storms of the past.